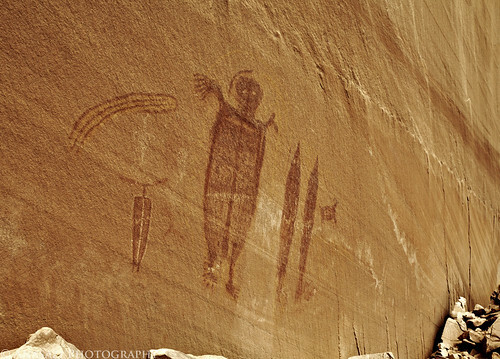 Here’s a very cool panel of Barrier Canyon Style pictographs located near Moab. It’s also a tough one to get a good photo of since it is in direct sunlight most of the day and the pigments are already pretty faded. It’s pretty amazing to think about just how well the paints used have managed to hold up to the UV rays of the direct sunlight for possibly thousands of years! Luckily, the day I visited this panel earlier this year there was just enough hazy cloud-cover in the sky to help me get some better photos. I think it would be even better on a very overcast day. Even though it’s hard to see, if you look closely at the figure that looks like a comet, you can see the very faint yellow pigment. Above the largest anthropomorph (which is life-sized) there are a few yellow arches that go from hand to hand, but they are very faded in this photo. A very interesting panel, indeed!